A high-quality conference interpreter gives people an exceptional experience with your brand. Rapport International's simultaneous interpretation services make your business look good. Save time and frustration with skilled conference interpreters. You're looking for a conference interpreter; budget concerns and timelines are ringing in your ear. How do you find the best interpreter for your money? Hiring a high-quality conference interpreter will save you time and frustration later on. 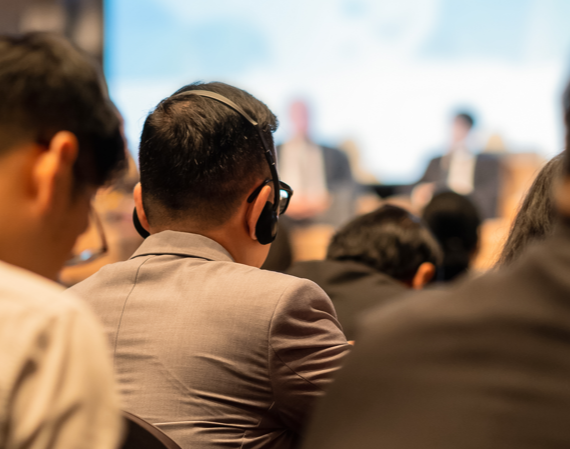 Conference interpreting, also referred to as simultaneous interpreting, transforms verbal communication from one language to another language in real time, or concurrent, with the original speech. It's effective for large groups, conferences, conventions and seminars. Real-time conference interpreters in any language. Commercial grade conference interpretation equipment. Read more. Quality conference interpreters through a vetted hiring process. This is a skilled profession where the speaker does not pause for the interpreter. There is extreme pressure on simultaneous interpreters to deliver an accurate message in the target-language as quickly as he or she can formulate it from the source language. Performance standards usually include two interpreters per language to relieve some of the pressure for this type of interpreting. Conference interpreting usually involves simultaneous interpreting equipment. For large conferences a spoken language simultaneous interpreter, sitting in a soundproof booth, speaks into a microphone, while clearly seeing and hearing the source-language speaker via earphones. The simultaneous interpretation is rendered to the target-language listeners via their earphones. Rapport International’s solves your conference interpretation needs by working with the best simultaneous interpreters out there. You'll get conference interpreters that hold multiple certifications and pass through our quality assessment. We don't let any interpreter come to you without these requirements. Curious about the costs of interpretations? Need to know which factors play a role in timing? Learn more about costs and expectations by understanding the factors and guidelines with interpretation pricing. "Your Burmese interpreter has done several appointments for us and he always does a great job. He is always on time and very professional. He is very good and helpful and the team here loves him." "I could never have done this without your interpreter. Excellent experience. She was very kind and compassionate."